Feedback is very important for us and our customers. See below please email any feedback or suggestions about our products here please take a little time to add some feedback .. thank you for your time. I will post all feedback received on this page! We realise purchasing a product from a website can sometimes be a daunting prospect. Our philosophy is to offer our customers the best products and service at a competative price. In order to help potential customers we are starting to post feedback and testimonials from customers. 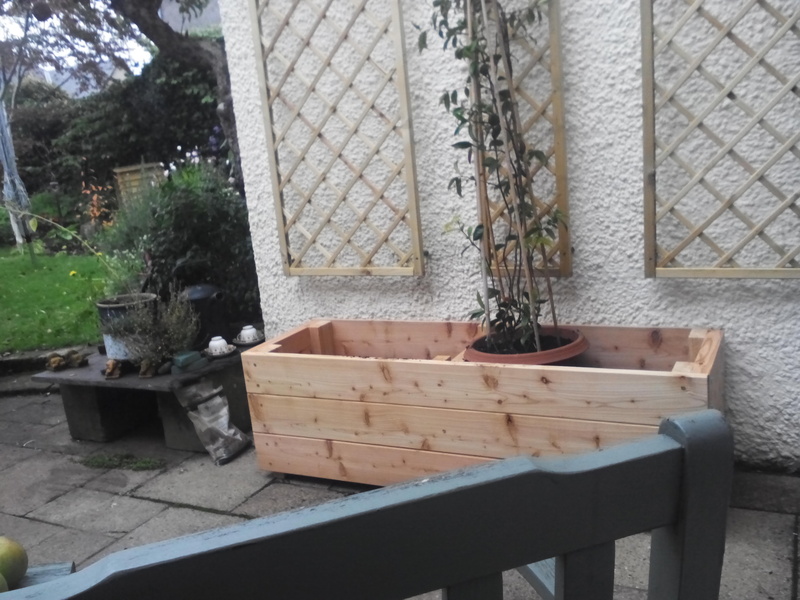 Really pleased with the planter, beautiful wood and clear instructions, it was delivered yesterday and my husband put it together, its now ready for the soil and compost and the star jasmine we are planting in it. I am so delighted with the 1.45met workbench you supplied. It is sturdy and easy to put together (thanks to the predrilled holes). Delivery was very quick. Also a massive thank you for supplying the extra pieces of wood, cut to the correct size to enable me to fit my woodwork vice. I will be recommending your company to family and friends. Thought I’d share a picture, primed and painted in Farrow and Ball Off Black. Very pleased with them and the service you provided. We just purchased a planter (with legs) from yourselves and having assembled it I wanted to tell you how pleased we are with this piece of kit. Not only is it well made and easy to put together it is also very robust, something perhaps we should expect but don’t often get with garden equipment bought on line. What a wonderful product, really easy and most of all.. its sturdy! I had two raised beds delivered last week, both were wobbly and much more expensive so I sent them back (www.xxxxxxx.com- never ever again, total rubbish!). Thanks to you I am happy now, let the gardening begin! Just wanted to thank you for the fab. gardening trough. Its great quality and really easy to build and very sturdy, bought it for my mother in law who is delighted with it, thanks. ” Garden Larch has been brilliant from start to finish. Before we bought the vegetable beds, they were very helpful on the phone and clearly knew what they were talking about, offering useful and insightful advice which swayed our decision to go with them. We found them to be quick and on time with delivery and very professional in their communication, attitude and work. As a relatively large Junior School, we were looking for a product which would be sturdy enough to cope with regular use and last long enough to justify the investment. We also love the fact that Larch is such a naturally good product and that we can avoid the ingress of chemicals into the soil which we would have had with other treated woods. This is a real bonus to our environmentally friendly outlook and what we are trying to teach the children about sustainability and producing organic food. The food we grow will be used in the school kitchen so this helps to promote our healthy eating policy. The raised beds themselves are fantastic! The quality is far better than we expected and they will clearly stand the test of time, not only from the weather but also from the many children who are going to be using them. They are incredibly sturdy and fit together well, whilst the planed wood means the children are less likely to get splinters. We are also impressed with the design which allows for netting to be attached over the top more easily with the slightly raised corner posts. 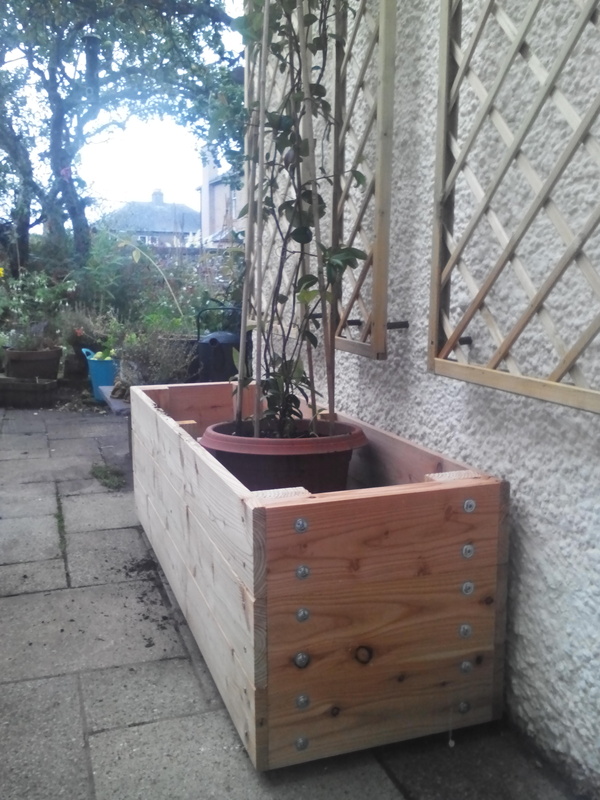 “Thanks so much for the four excellent planters received last week. Sturdy, solid, easy to assemble and look great. Thanks also for taking my call the other day checking you out! Having been scammed once on the web a necessary precaution! Nice to do business with a Lancashire company too. I will be asking you to build something specific in autumn probably. My planters arrived this afternoon, and duly spent an hour assembling the trough (I am quite small and not particularly strong!!!). Well, they are absolutely fantastic! Thank you so much. They look stunning on our patio, and as you say, are completely in proportion to each other. They are beautiful to look at, and I know they will receive much admiration for years to come – a credit to your craftsmanship. Our garden has been a lengthy project, and once I have planted-up, it will all be finished – phew! I have tried to express this in my feedback, but the number of characters is very limiting. I honestly think you are under-selling your products. I tendered several quotes – no one else came close! In July Karen Wilgoose purchased ultimate heavy duty double high raised beds – click here and ultimate heavy duty tripple high raised beds. Thought I would send you a picture of the raised beds that you supplied back in july. I’ve been meaning to send you one for ages! We are really delighted with the product. They are so study and look fantastic. Thank you for your efficient and quick service too. Just to say how delighted I am at my raised bed order. I assembled one at the weekend after digging out the ground underneath. I even managed to get free compost from the council to fill it. Your product is far superior to many others I have seen in garden centres etc. I’ll be back when I need some more larch products. In March 2012 we supplied Steve Wilkinson with 3 bespoke raised beds. The raised beds were 11ft long x 2ft 6in wide made from 2 inch thick planed all round larch. Steve sent us these pictures to show how the beds looked planted up and is very pleased with the results! In September 2012 we assembled and supplied Claire Britton with 2 x 1.5m workbenches. We assembled them, then arranged delivery by pallet so Claire did not have to assemble them. Many thanks for the workbenches, and the quick service! And thankyou for assembling them for me, you saved me a fair bit of time and trouble! Chris, it all went together really well. Clear instructions helped. Really pleased with fit and finish. 10/10. Attached are a few photos from when planting up back in the summer. allotment, so will be aiming to order more then for the vegetables there. Just to let you know the bench arrived on time and I finally managed to get it assembled last weekend. It really is a substantial bench, I’m very impressed with it and wanted to drop you a line to say thanks very much. Just a short note to say how pleased I am with the workbench I recently purchased from you. It was easy to erect, is sturdy and looks great in the garage. Many thanks and best wishes for 2013. “Just wanted to say a big “THANK YOU!” for sending out the planter so quickly! My goodness…it came at 5.30pm yesterday and I only ordered it the previous morning…and you cut it down especially for me too! Wish all companies were like you guys at Garden Larch! Hopefully the weather will hold up over the weekend so I can get it up and running…touch hairy wood. Thanks ever so much again. Wooden trough extra high easy reach great for sitting next too. We ordered an extra high Garden Trough, which we received earlier this week. We were so impressed with the workmanship and the speed of delivery we ordered another one which duly arrived yesterday, two days after ordering. They were so easy to put together. They now have pride of place in our garden waiting to be planted out. Fantastic quality product, excellent service, It goes without saying that I have no problem in recommending your company and products to my family and friends. Thanks again from Susan, the Hither Green Society and most of all from me. “Hi Chris, bench arrived yesterday and is already installed in my workshop. Many thanks for your excellent service and product. Just a quick follow up to say raised bed arrived this morning (Friday). Bit too wet to do any work outside, but have unpacked it and am very impressed with it’s good solid construction and finish. Glad I found you on the internet and that I also went for this particular bed. Thank you SO much for the wonderful nest box kits! They are really amazing and the children will be so excited to make their own boxes. What a great service and price from you. We are very impressed! Just wanted to say that I finally managed to put the bed together, 2 weeks after delivery!! Can’t believe it only took 10 mins. It’s a fantastic product so just wanted to say well done. “So pleased with my extra high trough that I’ve ordered another one -Just what I wanted – will be using them for veggies – intend to thwart the slugs this year by having them in the middle of my backyard with copper tape round the legs! Service, packing, delivery all excellent! “Another high trough delivered – perfect for my veggies! Very impressed with your customer service, Chris – very accommodating with changing delivery date. “Excellent quality, excellent price, excellent service, easy to build in minutes, and they look great. On 3/4/14 Mrf Newton -Tyres ordered 2 bespoke planters for on top of his narrow boat. Delighted with the planters thanks. Had to cut a bit off the legs to suit the roof, we get loads of comments, and loads of passers by taking pics. Steve Kearns ordered some bespoke planters complete with lids to create a seating area. I know that it has been a while so apologies for the delay in getting some pictures over to you as I had promised. We have only just got to the point where I felt it was worth sharing. As I said at the time of ordering I’d give you the final pictures so that you could see what I had planned. I think that this could be a nice addition to your range of planters, another string to the bow if you like. We love spending time out there that’s for sure. Thanks again for all of the planters that we ordered and for your great service at the time, I will be sure to recommend you in the future if anyone asks. 28/8/14 Judy Dodd ordered a bespoke size planter, similar to the one below. Received the planter yesterday and husband and I have just put it together. I have to say it is brilliant and I am very impressed with the planter and the service you provide. Needless to say if we require any type of planter in the future we will not hesitate to get in touch with you and will recommend you to our friends. Many thanks for the planters, you were the first delivery on Friday. They look fantastic (see pic), planted them alone on Sunday, backbreaking work but worth it! “Thanks for the delivery which came on time. My husband put the planter together this morning and everything fits and it looks lovely. He commented on the good quality of the planter and we would happily buy from you again. Thanks for a very good product at an execllent price and great customer service. In March 2015 Garry Straton purchased 2 x 1.5m solid oak workbenches. Further to you supplying two work benches to be joined to make a single 3m length, I wanted to let you know how pleased I am with the result. It fits perfectly in my shed, and looks great with a couple of coats of hardwax oil. Thanks again for taking the time and trouble to meet my specific requirements. Thank you – I am delighted with the garden trough – just what I was looking for – easy to put together, sturdy and looks great in the garden! Happy customer! It is GORGEOUS! Beautiful workmanship, solid as a rock, perfect in every way—not even the tiniest of dinks, and… a fantastic price too! I can’t thank you enough. Wishing you huge future success with your business. You deserve it.